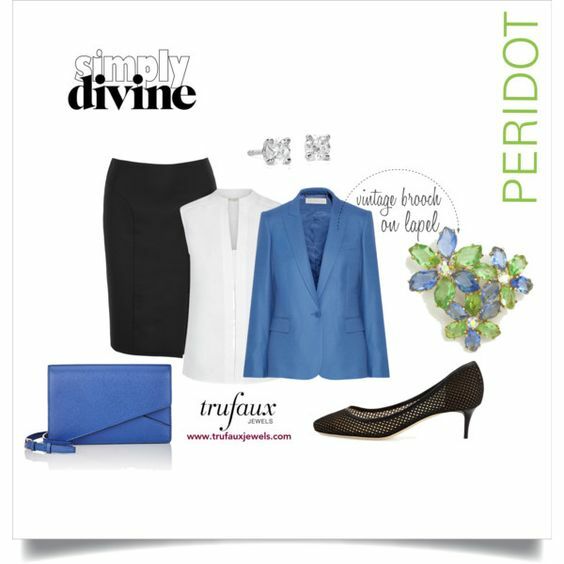 Pale, yellow-green in tone, peridot has always been associated with light. In fact, ancient Egyptians called it the gem of the sun. Peridot is said to bring the wearer power and influence as well as healing properties to protect against nightmares. Because King Edward VII considered the peridot his good luck stone, it was especially popular in Edwardian jewelry. Green is the color of birth, renewal, and rebirth. 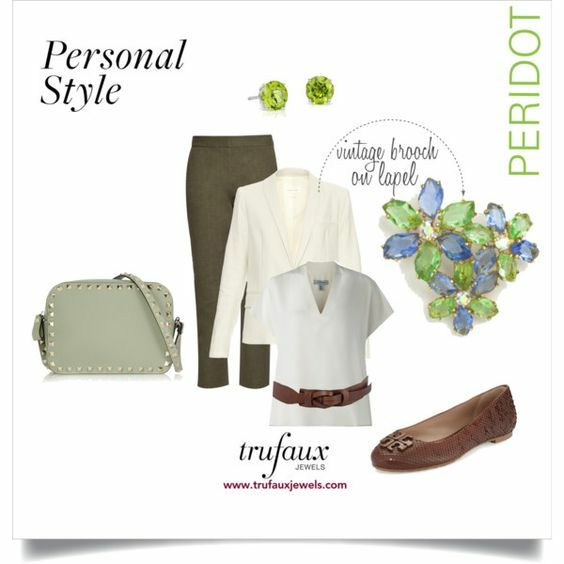 If you’re unlikely to choose this earth tone in clothing, peridot jewelry can bring vibrancy and new life to your existing wardrobe. Add this hue to neutral colors – white/cream, navy, grey, brown, and black – to create new and unique looks. For this month’s styling tips, I’ve selected this Sapphire & Peridot Flower 1950s Brooch by Elsa Schiaparelli for many reasons. For one thing, I am a big fan of hers. 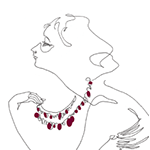 (I’ve written a blog post about her life and work – see Elsa Schiaparelli: Shocking!) This particular piece is a great example, with its soft, yet vibrant color combination. 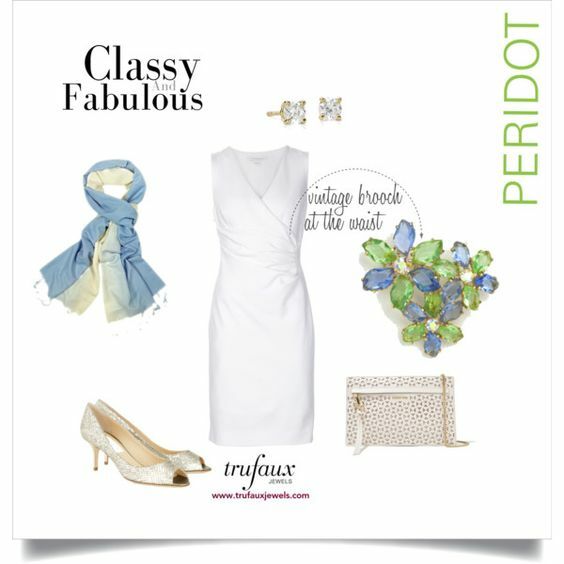 The addition of pale sapphire stones adds appeal and versatility to the peridot, a color some may find limiting. The layered formation of the three flowers adds dimension to the brooch. 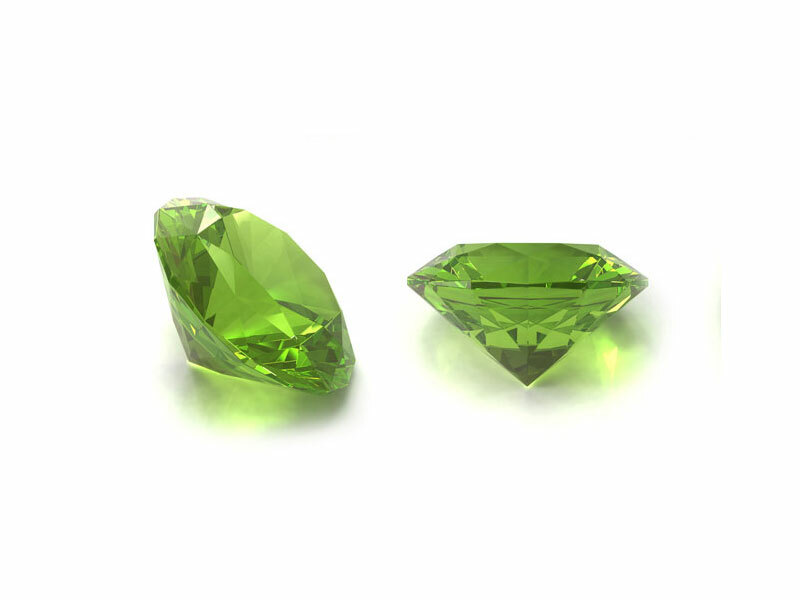 The faceted peridot- and sapphire-colored glass stone petals are a unique shape (a feature usually found in Schiaparelli pieces). 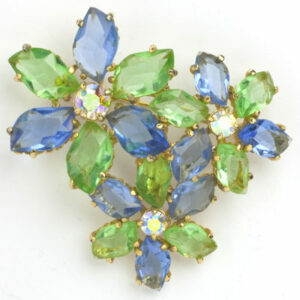 The aurora borealis rhinestone flower centers add shimmer. And I wanted to illustrate different ways of wearing a brooch! 1. I love the color combination of bright blue and black, and designers oblige by coming up with bright blue blazers every season. Whether you choose a pencil skirt or trousers, wear this brooch on your jacket lapel to make a statement. 2. Who says a grey suit has to be boring? Liven up this monochrome classic ensemble with touches of bright green. Wear the brooch on the jacket lapel or shoulder, depending on the cut of your jacket. If you wear earrings, add your real or faux diamond studs (to compliment the flower centers). 3. 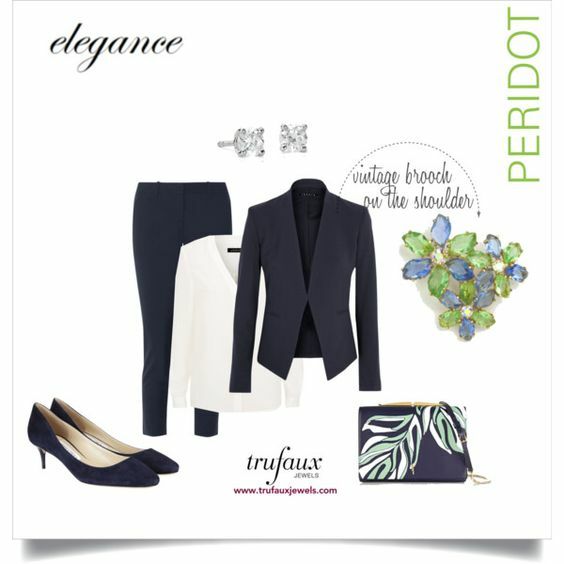 Here’s a very elegant look with a navy suit and cream silk blouse. With this style of jacket, wear the brooch on your shoulder. Your faux or real diamond studs are the only other jewels you need. 4. This outfit of olive green trousers topped with a white blouse and blazer combines shades of green with other earthy tones. 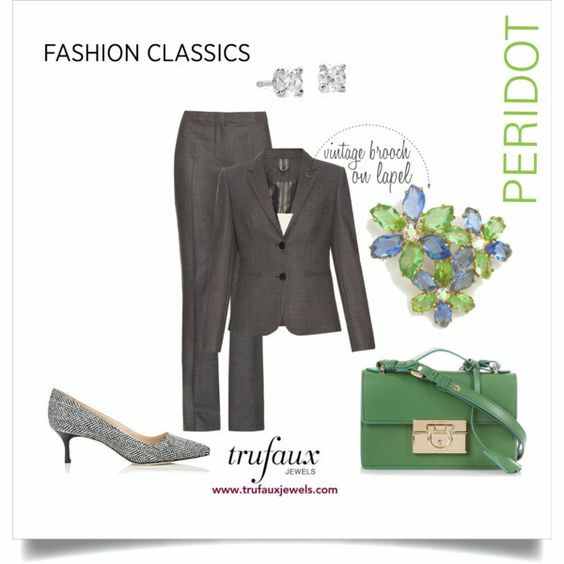 This brooch elevates the cool and casual olive hue to a feminine and sophisticated look. 5. If your uniform is a wrap dress, have you thought about creating a new look by wearing a brooch at the waist? This white sheath is shown with gold peep-toe pumps, for a dressier outfit. You could achieve the same effect with winter white or another neutral. Just add a coordinating bag and wrap (if any).